Present your photo studio in the most exciting way using Worly theme. 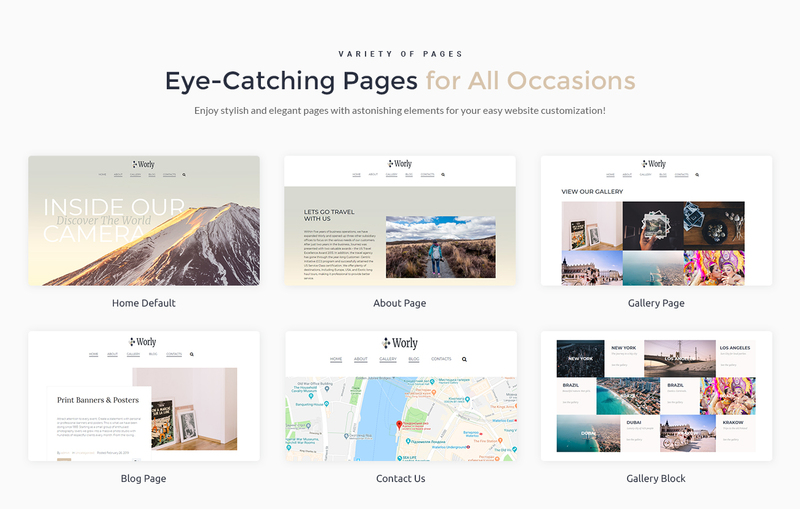 You will inform visitors about your studio, projects, showcase eye-catching images in the gallery and much more with this multipurpose theme. You will create a professional website according to your needs and with a convenient interface. There are Jet plugins for Elementor page builder, which will be helpful by building your website. JetElements plugin will provide a lot of useful widgets for enriching content with stylish elements without any coding knowledge. Using JetThemeCore plugin you will be able to create custom headers, footers, sections, also to select pre-designed blocks and insert them into pages easily and quickly. With JetBlocks plugin you will implement additional functionality to headers and footers in a few clicks. You will liven up your website with alluring animation effects with the help of JetTricks plugin. Expand your client base and create a special image of your photo studio using a responsive Worly theme.